Natalie Coward Anderson works for the Cambridge-based refugee agency RefugePoint. Her writings are based on her work in Africa. 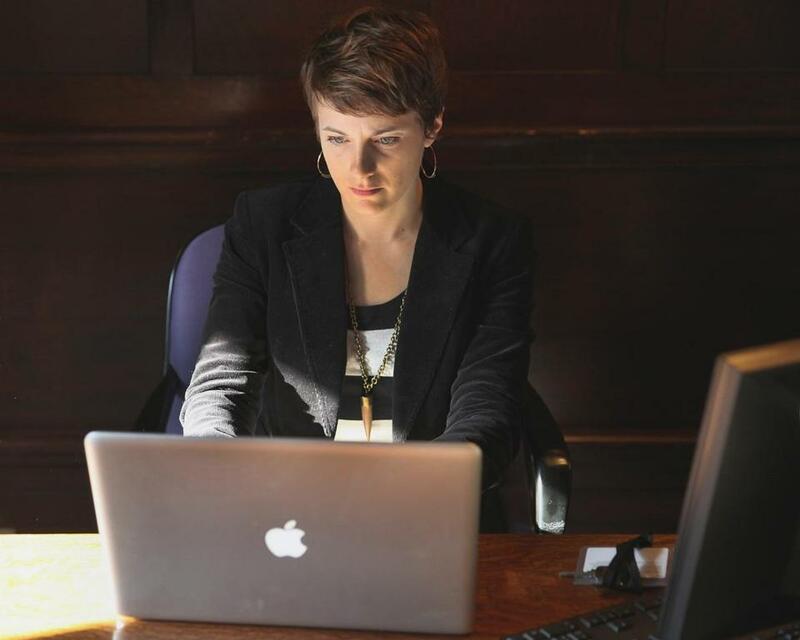 Natalie Coward Anderson of Charlestown was certain she was a long shot for this year’s Children’s Writer-in-Residence fellowship at the Boston Public Library. She had no publishing history. No MFA. Not a single college writing course. “No sense of how good or bad my writing really was other than my mother saying it was ‘really nice, sweetie,’ ” said Anderson, 33. She did have a story to tell, though, or as she put it, “four thousand, give or take.” Anderson works for the Cambridge-based refugee agency RefugePoint, and between 2007 and 2010 she listened to the stories of Somalis, Congolese, and Eritreans who had been displaced by conflict and were living in camps, villages, and cities across Africa. “If you want a story that will make you ponder the limits of the darkness of a soul, I have it,” Anderson wrote in her application. Stories lodged in her memory, even when she tried to not remember them. Images haunted her, like that of the woman with no nose: A hyena had mauled her face as she fled Somalia for Kenya. For relief, she read children’s books like the Harry Potter series “with satisfying endings where the bad guys can be relied upon to get their comeuppance,” she said. Kenyan girl whose mother was murdered by a ruthless criminal, and who survives the only way she can “that doesn’t involve getting pregnant” — by becoming a thief. “She could have been any of the girls I met and listened to,” Anderson said in an interview. With low hopes, she applied to the Writer-in-Residence program, a nine-month residency for emerging children’s book writers that comes with a $20,000 stipend and office space in the library at Copley Square. 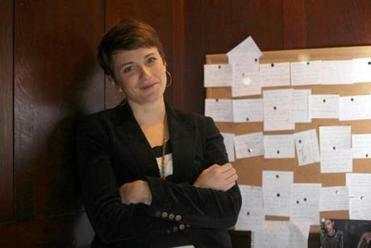 Writer-in-Residence fellow Natalie Coward Anderson has plotted her novel on index cards in her office at the Boston Public Library. Her path from refugee worker to children’s book writer has not been a straight shot. “Life seems to be a series of random events that worked out really nicely,” said the petite Anderson, who has a pixie-ish haircut and a penchant for earrings that make a statement. Charlestown with her husband, Martin Anderson, who also works for RefugePoint. For a program that’s been around 11 years, the Writer-in-Residence fellowship has a surprisingly low profile. “It’s totally under the radar,” said Anderson, who heard about it from a member of a writing critique group she used to belong to. The fellowship is sponsored by the Associates of the Boston Public Library, an independent nonprofit that works to conserve, digitize, and promote the BPL’s special collections of rare books and other historically significant items, and sponsors a variety of programs supporting literary and cultural endeavors. The residency program is underwritten by an anonymous benefactor — anonymous even to Anderson. The benefactor did, however, offer a statement explaining why. It’s fair to say it has a record now. Previous fellows have published, or are in the process of publishing, 16 books. They include Hannah Barnaby, who published “Wonder Show”; Anna Staniszewski, whose titles include “The Dirt Diary” and “The Prank List”; and Elaine Dimopoulos whose novel “Material Girls” will be published this year. Dimopoulos said the program was life-changing for her. Anderson in Nairobi working with a client for RefugePoint. Judges aren’t told who the applicants are, and see only a proposal and a writing sample. Anderson was their overwhelming first choice, Andres said. They were deeply impressed by Anderson’s voice and her story, and the quality of her writing. “In this era of a flood of dystopian literature, which is highly fantasized, it is eye-opening to encounter a true dystopia — that of poverty in Africa in which nothing need be fantasized,” said Kathryn Lasky, author of “Guardians of Ga’Hoole,” who was a judge. Anderson spends two days a week on the second floor of the BPL’s McKim Building in a mahogany-lined office that reminds her of Harry Potter’s Hogwarts, complete with a staircase that leads to a mysterious locked door. The office has a “weird mojo,” she said, that seems to have cured her tendency to be distracted. “It’s kind of weird how well I work here,” she said. She has completed her first draft of the book, which she has plotted out on index cards. In partnership with the library, she plans to work with incarcerated youth. Linda Matchan can be reached at linda.matchan@globe.com.